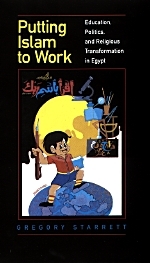 The development of mass education and the mass media have transformed the Islamic tradition in contemporary Egypt and the wider Muslim world. In Putting Islam to Work, Gregory Starrett focuses on the historical interplay of power and public culture, showing how these new forms of communication and a growing state interest in religious instruction have changed the way the Islamic tradition is reproduced. During the twentieth century new styles of religious education, based not on the recitation of sacred texts but on moral indoctrination, have been harnessed for use in economic, political, and social development programs. More recently they have become part of the Egyptian government's strategy for combating Islamist political opposition. But in the course of this struggle, the western-style educational techniques that were adopted to generate political stability have instead resulted in a rapid Islamization of public space, the undermining of traditional religious authority structures, and a crisis of political legitimacy. Using historical, textual, and ethnographic evidence, Gregory Starrett demonstrates that today's Islamic resurgence is rooted in new ways of thinking about Islam that are based in the market, the media, and the school. Gregory Starrett is Assistant Professor of Anthropology at the University of North Carolina, Charlotte.